Frequent travelers to Canada, listen up! 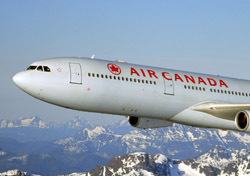 Air Canada is offering a Spring Getaway Pass for unlimited travel on Tuesdays, Saturdays, and Sundays between its destinations in the U.S. and Canada. Starting at $598, including taxes and fees, online seat selection, and a set amount of Aeroplan frequent flyer miles, the pass can be modified for each traveler’s specific preferences. It is available for one or two travelers for one or two months in one of three different geographic zones: eastern, western, and North America. Book the Spring Getaway Pass by March 20, for travel from April 1 to 29, or April 1 through June 1, depending on whether you choose the one- or two-month pass. Travelers who choose the two-month pass can add on an International Sample Pass and fly to London, Paris, or Shanghai for $160. The international pass is valid for booking through April 1, for travel on any day in April.